As one would-be giant hospital merger in the Chicago area fell apart this week, a rival is creating a model it hopes will entice other partners to join it. Rush University Medical Center, an academic hospital on the Near West Side, Rush-Copley Medical Center in Aurora and Rush Oak Park Hospital in that west suburb are now officially operating as one academic health network. They have a new parent system simply called Rush, which will steer the strategy and dollars from a new 13-member board of trustees with an eye toward growth. Dr. Larry Goodman, now CEO of Rush University Medical Center, will be the CEO of the entire system in addition to his current role. "We want to make sure patients can access the kind of quality care they can expect anywhere there is the Rush name," Goodman explained. The system is positioning itself to be among the handful of local hospital networks still operating in the coming years, as experts predict that nationwide hospitals will shutter or partner up to survive as doctors focus on prevention and treat patients in cheaper, outpatient settings. Rush has been relatively quiet on the merger front while other big Chicago area health systems like Advocate Health Care, Northwestern Memorial HealthCare and University of Chicago Medicine have wooed smaller systems or hospitals to join them. Hopes for Downers Grove-based Advocate, the largest hospital network in Illinois, were dashed earlier this week when the system called off a merger with NorthShore University HealthSystem in Evanston after a federal judge sided with antitrust regulators worried that the union would hike prices for consumers. Combined, the new health system would have been the 11th largest non-profit hospital network in the nation. The new Rush is packaging and selling itself as one. The perks: it's a research-focused hub with a built-in pipeline of future medical workers (doctors, nurses, researchers) now studying at Rush University. It has about 1,800 physicians and an expansive outpatient footprint, with new sites opening in Chicago's River North and South Loop neighborhoods, and in Oak Brook. 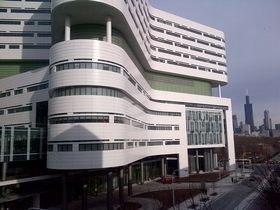 An estimated $500 million outpost on Rush University Medical Center's campus is underway. Goodman said there's likely more to come. Each hospital in the system will retain its own board and management. But investments in Rush-Copley underscore how the enhanced partnership is already paying off. It's installing a roughly $40 million electronic medical records system from Epic, as part of an effort to have each Rush hospital on the same IT platform to better coordinate patients' care. The hospital, already a market share leader in the west suburbs, also needed help adding additional expensive specialists, such as neurologists, to its roster. "I think once those things are all in place, there's an opportunity to see cost savings and clinical enhancements," said Barry Finn, CEO of Rush-Copley. "We're starting from a fairly strong position to begin with." Bruce Elegant, CEO of Rush Oak Park, said the hospital has earned a prestigious Magnet designation for its nurses and cut costs per patient visit by about 10 percent since Rush University Medical Center took over in 2012 from Wheaton Franciscan. Dr. Brian Cole, a prominent doctor for the Chicago Bulls and White Sox, became the chairman of surgery, the hospital is about to break ground on a new $30 million emergency department, and it plans to add about 30 specialists from Rush University Medical Center. That's about a third more than this community hospital has now. In the last five years, there's been more of a focus to "elevate Rush Oak Park Hospital to be at the same level as Rush," Elegant said in a nod to the academic medical center. As the bolstered system looks to expand, it's in talks with other physicians and hospitals to share its expertise and programs. For example, it already offers telestroke services in 11 emergency departments. It's in building these relationships that Rush might find its next partner.